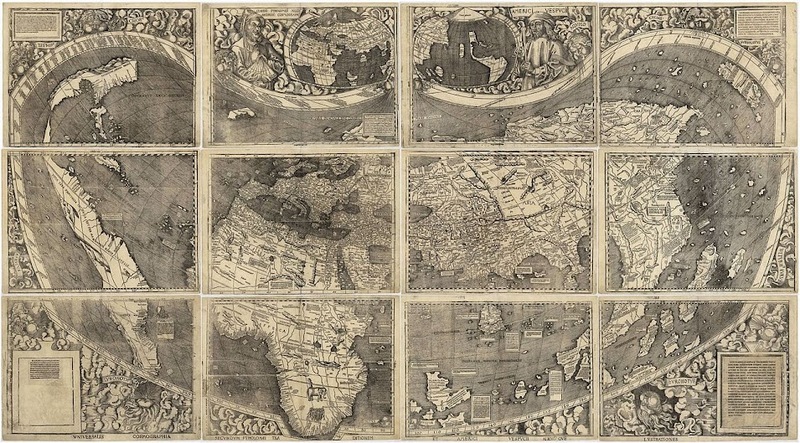 The American continent is the only one named after a real person, and the reason it bears that name is a map from 1507. Martin Waldseemüller, Universalis Cosmographia — detail, 1507, Library of Congress, Washington, D.C. In 1507, Martin Waldseemüller and Matthias Ringmann were working on a new map of the world, and they had to decide what to call the new land mass that had been explored between 1499 and 1502. They did not name the new land after Christopher Columbus, perhaps because Columbus had always said that he had found a new way to the Indies in Asia, not a new continent. They could not name it after the first Europeans who had traveled to the American continent, because they probably did not know that Vikings had been there around the year 1000. After all, evidence of Viking presence in America was only uncovered in 1960. Instead, the map-makers decided to name the land after Amerigo Vespucci, the Florentine navigator who had famously explored the coast of what is now South America between 1499 and 1502. They believed that Vespucci was the first to realize that the land was a whole new continent and not a part of Asia, so they gave him credit for his discovery by naming the land after him. At the time, Latin was still the language of international communication in Europe, so the German map-makers knew Amerigo Vespucci as Americus Vespucius, which is the Latin form of his name. Because they believed that Europe and Asia were feminine names, the map-makers decided to use the feminine version of Americus’ name, America, for the new land in the bottom left-hand corner of their map. Martin Waldseemüller, Universalis Cosmographia, 1507, Library of Congress, Washington, D.C. Copies of the map spread throughout Europe and, despite disagreements, the name “America” stuck, eventually referring to not only the southern area of the new land mass, but also to its northern and central parts. And that’s how the New World came to be known as America.